Rolls-Royce, best known for its luxury cars and aero engine manufacturing, is now developing tiny “robot cockroaches” to fix plane engines. 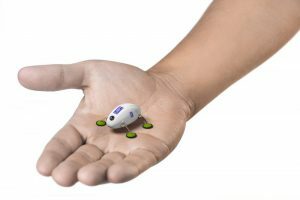 The company teamed up with robotics experts at Harvard University and the University of Nottingham to develop these tiny insect-like robots. These tiny bots will crawl into the tight spots in the engines to find and fix the problems. Rolls-Royce says that the cockroach-inspired robotic bugs have been in development for the last eight years. But the prototypes aren’t quite ready to perform repairs since they are larger than desired. Engineers are working to scale them down to a 15-millimeter size and equip them with tiny cameras. Once the size issues are worked out, engineers could use the bots as a sort of reconnaissance tool to spot problem areas and perform minor maintenance. After the job is finished, these tiny bugs could be programmed to leave the engine or could simply be “flushed out” by the engine itself.